I am NOT a runner. Period. Never have been, I naturally walk very fast (probably has nothing to do with my being 5’2”) but run – forget about it. 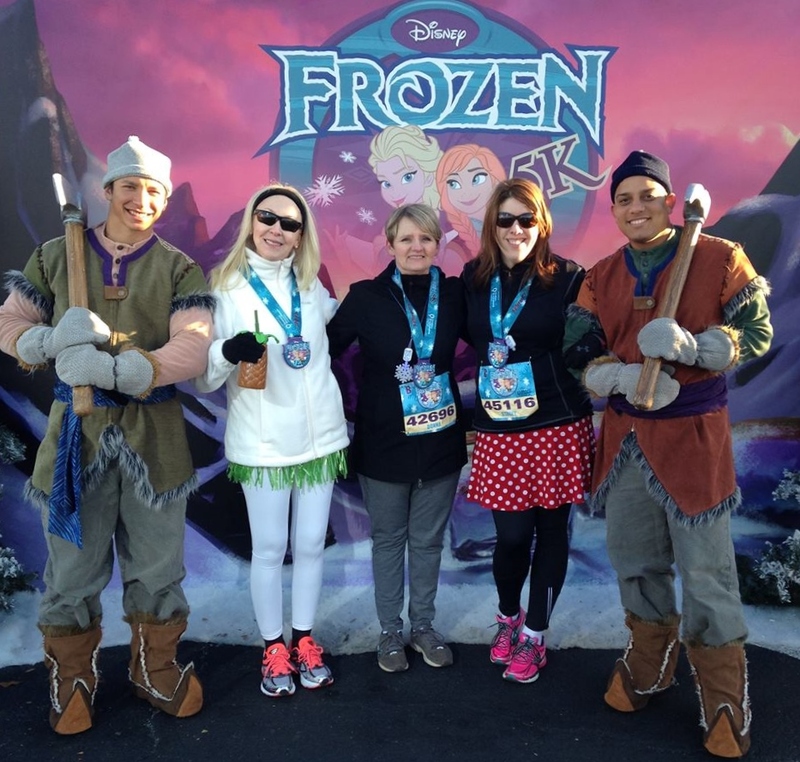 But I would do anything to meet my Disney BFF, Didi of Distherapy, who convinced me to try the Frozen 5K. I swear I told her I just wanted to be part of her chEAR squad for the 2015 Princess Half...BUT SOMEHOW THIS HAPPENED! See our Wicked Awesome medals? This is post race - I made it!! My excitement really began on registration day, I was all signed in and ready to register. It was a little crazy, who knew so many people wanted to run a 5K?? ?, but I finally got in and was all pumped up for my first runDisney event! It was official, I had a number, I was going to be running in the Frozen 5K! This was getting real! Now it was on to making plans and creating costumes and counting down the days. Time went by a lot quicker than I had anticipated. As a matter of fact, I really thought I was going to have to back out after a series of personal things came up, but thanks to my two amazing friends and my boss, we found a way to make it happen and I was headed south to FINALLY meet Didi and my new friend Stacey of Rhode Island Mom. I was going to be at Walt Disney World for a little more than 36 hours, a short but very sweet trip for sure. After a six and half hour drive, and my getting lost in the crazy Walt Disney World traffic, I finally made it to the Expo. I swear the guy who was greeting people and the door and guiding them in the right direction must have thought I was a weirdo, getting excited any time I saw a lady with long blond hair. Then I saw my two girls, and just like I knew it would be, it was as if we had done this together a hundred times before. For you first-timers, the Expo is set up at the ESPN Wild World of Sports Complex and it is where you get your race bib, t-shirt, find out your corral, ect. It’s also full of lots of vendors with great merchandise so come prepared! I am really glad I had my runDisney pros to help me navigate my way through. While we were there we got to meet Mouse Fan Diane and her kids, and the king of runDisney - JeffGalloway. If you are thinking of participating in a runDisney event he is your guy – and be sure to check out DIStherapy (she's an official blogger for Jeff), Didi has some awesome tips!! After a great meal we were off to our resort – Port Orleans French Quarter – for a little sleep. I say a little sleep because you have to be in the lobby EARLY to catch the bus to the race location. I believe we were there at about 4:15am to catch the bus and sat in front of the most adorable little girl who was running with her father. This was not her first race either, she was inspirational. And it was COLD – I mean bone chilling cold – so word of warning just because it’s Florida doesn’t mean you don’t have to come prepared for cold weather. Bring a jacket, and if you get warmer during the race just ditch it and it is donated to a local charity. When we arrived for the Frozen 5K it was full of very cold, but very exuberant runners. Everyone was so happy to be there and so excited about the event, and we had some great entertainment to get us even more pumped up and ready to run! The camaraderie amongst participants is incredible! You couldn't ask for a more friendly or accommodating crowd - I love Disney people! I was admittedly nervous about the running, you see I had not really trained at all. I am in overall good health but, as I said I am not a runner, so I walked a lot of the way. My dear sweet troopers stayed right there with me every step of the way, and I have the pictures to prove it. As we entered Epcot you could hear Let It Go playing through the intercom system, a great touch was that it was being sang in the native language of every country as we ran through it. As always, Disney was taking care of every little detail. There were characters along the way, but we charged on and didn’t stop to wait in the incredibly long lines for our photo op. We did however stop at the mile markers to snap a pic. And with every mile that went by I loved by two amazing friends a little more! By the time we could see the finish line we decided to actually run the rest of the way, and as fate would have it Sweet Home Alabama was singing me into the finish. After receiving our medals and taking a few “We did it!” photos we strolled back toward to park happily chatting along the way. We were practically alone as we strolled over to Akershus for a breakfast with royalty, but I will save our day in Epcot for a future post. Spoiler alert – I FINALLY got to meet my favorite princess!! To Didi and Stacey, thanks so much for an amazing experience – but mostly thanks for being such awesome friends!! I can’t wait to do it all again, and next time I promise to run a whole lot more. I will send you both a Coke and a casserole. Bless your heart! By the way, these two awesome ladies ran the Princess Half and I am so proud of them!! Aren't they beautiful - inside and out! I highly encourage any of you who have been considering participating in a runDisney event to be the first to sign up when registration opens for the next race. It was an incredible experience that I will never forget, with two fabulous ladies I can't wait to do it with again! After you register you will need accommodations, park tickets and dining and I would love to help! Contact me at donnakay@thewdwguru.com or 877-825-6146 and I will be happy to take care of all the details of your runDisney vacation!